Don't rely on street signs for navigation. It is much easier to navigate point to point (e.g. Place de la Republique to Bastille) as the signs pointing to landmarks are much easier to spot and read. A street map is still a necessity for the side streets. When you get near your destination, slow down and start searching for the blue street signs that tend to hide behind trees, billboards, etc. Bus lanes = bike lanes. While you don't want to get stuck breathing the diesel exhaust of a bus, the lanes do double duty. Bus/bike lanes provide direct routes through the city and buses are easy to pass when they stop for passengers. There are even bicyclist-level traffic signals so you won't get a neck cramp waiting for the light to turn green! Parisian drivers are polite! I've heard more than one story about rude Parisians but my experience was quite the opposite even on the bike. On many occasions drivers would slow down to give me room on a narrow street or a roundabout. 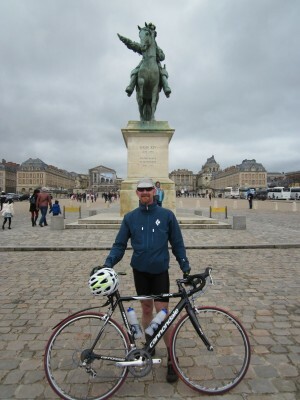 On my road bike tour to Versailles and back (Thanks to Paris Bike Company!) drivers were considerate and cautious even as I bounced along the very busy and roughly cobbled Avenue des Champs-Élysées. Parisian cyclists don't wear helmets. The majority of the city bikers I saw were bare-headed, but wearing a stylish scarf of course. Interestingly, the few recreational and sport cyclists I saw did wear helmets. What was even more startling was to see a Parisian pedaling along with a lit cigarette in their free hand! Is Paris a cycling paradise? Not quite, but it is better than I expected and even better than my home town.